This Lovely Life: TIME TO WRAP IT UP! 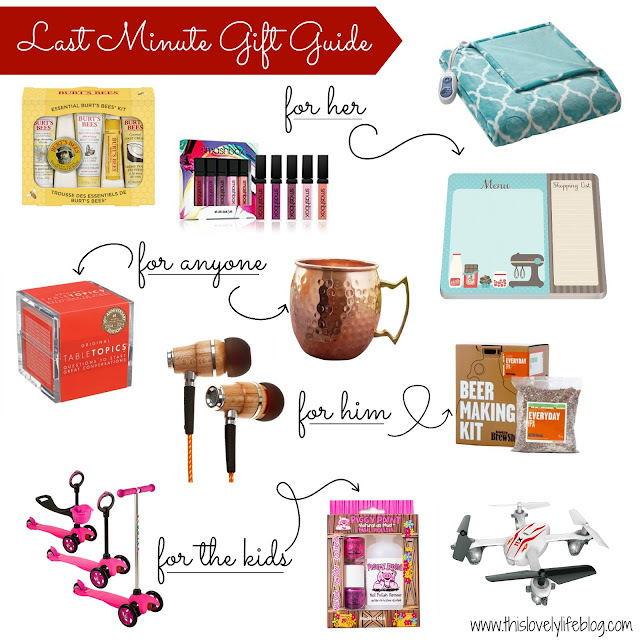 In case you're still scrambling to wrap up <---- like that :) your Christmas shopping, I thought I would put together a few ideas that might suit someone on your list, or maybe inspire an idea you hadn't thought of yet. I did a ton of my Christmas shopping on Amazon this year, which if you know me is no surprise. Amazon is probably the most often used predicted text on my phone. Whatever. It's convenient. Especially if you have Amazon Prime (which I, of course, do! ), because you can get free 2-day shipping on tons of items. With time running out, Prime shopping is a great option if you don't have time to get to the stores or just don't feel like fighting the ever present crowds this time of year. Burt's Bees A Burt's Bees set is super affordable and sure to be appreciated! Lip Gloss If you have a beauty lover still on your list, this Smashbox lip gloss set might just fit the bill. Heated Throw Anything in the realm of cozy as we head into Winter is a good bet! Notepad Have a list-maker on your list? Table Topics I got this for Jordan's stocking last year (though it could no longer hang by the chimney once it was in!) and we've really enjoyed going through the cards (a year later and we've still got tons we haven't made it to yet). I would definitely recommend this for anyone! There are tons of different sets too, so you should be able to find one to suit whoever you're buying for. Moscow Mule Mugs I've been seeing these everywhere lately! There are tons of options on Prime, from single mugs to sets. There's probably one (or a set) to suit just about anyone on your list. Headphones Obviously there about 10,382+ headphone options, but I thought these were particularly cool. And with the way stuff like this gets lost, who couldn't use a pair or even a spare? Beer Making Kit If you've got a beer drinker on your list, this could be fun! Several flavor options available. Scooter Adelaide got a scooter like this for Christmas last year and she's been riding it every single day lately. This one is awesome because it can transition from a sit down scooter for younger ones, to a classic stand and push scooter for older ones. Piggy Paint For the little ladies on your list, Piggy Paint is a lot of fun! Where are you in your Christmas shopping? Pretty well done or lots to go? Disclosure of Material Connection: Some of the links in the post above are “affiliate links.” This means if you click on the link and purchase the item, I will receive an affiliate commission (we're not talking a new wardrobe here, more like a few coins to rub together :). Regardless, I only recommend products I use personally and/or believe others may enjoy. Thank you for supporting the companies that support me and my family! They're everywhere aren't they?! I think they're just so pretty... kinda tempted myself! Thanks so much for checking it out and I hope you'll be back! I got my husband moscow mule mugs for his birthday this year an dhe loved them!! It's so awesome when you find something that works equally well for men and women! Are they any good for coffee? I'm kinda in love with the copper!